Guarana (Paullinia cupana K.) is derived from the seeds of a South American tree. These beautiful red berries have been used in Traditional Chinese Medicine for thousands of years to enhance mental alertness and memory, and to increase energy and stamina. Guarana seeds contain as much as 4-8% natural caffeine. The natural caffeine in Guarana is released slowly, sustaining the desired effects. 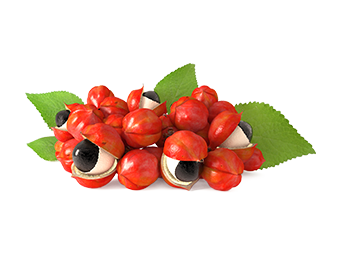 Guarana also contains trace amounts of theobromine and theophylline, as well as large amounts of flavonoids, alkaloids, saponins, terpenes and tannins.